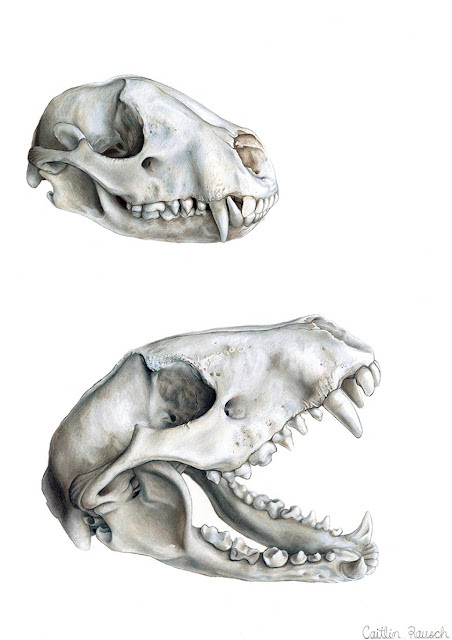 An illustration of a raccoon skull, jaw opened and closed, to show the detail of its shape and extension of the jaw. I used Prismacolor colored pencils for the soft gradual color changes in bone, and a bit of micron pen for the sharper edges it also has. This was created from a reference skull that I own, which allowed me to investigate all its detail to convey that in my illustration. I created this piece to really study the texture and light of bone.